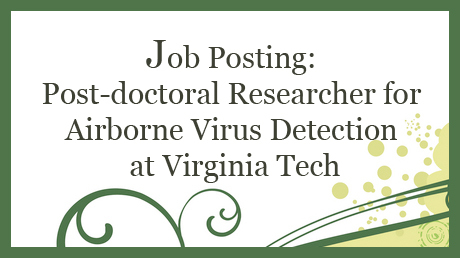 Job Posting: Post-doctoral Researcher for Airborne Virus Detection at Virginia Tech – microBEnet: the microbiology of the Built Environment network. We are seeking a post-doctoral researcher for a project to develop a nanotechnology-based sensor for airborne viruses. The ideal candidate will have experience with experimental techniques related to the generation, sampling, and detection of specific microorganisms in bioaerosols. The post-doctoral researcher will be co-advised by Dr. Linsey Marr and Dr. Peter Vikesland in the Department of Civil and Environmental Engineering at Virginia Tech in Blacksburg, Virginia. The position is funded for two years starting in July 2013. Applicants should send a cover letter describing their research experience and interests, a CV, and the names and contact information for three references to lmarr@vt.edu.